I almost walked out on our Lakota tour guide, right there in the church. Daniel Red Bird was speaking to our group in the back of Holy Rosary Mission on the Pine Ridge Indian Reservation in South Dakota. 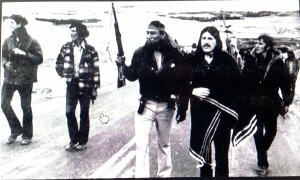 He was telling us yet another painful story of U.S.-Indian relations and kept using words like murder, massacre and ethnic cleansing to describe historical events I had associated with mere “deaths” and “battles”. 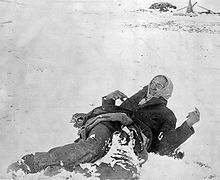 For example, the Battle of Wounded Knee became the U.S. government’s genocide of unarmed Lakota women and children at Wounded Knee. Other Lakota speakers used similar words and somewhere deep down I was beginning to resist these jarring versions of American history, and get angry. I was drawn to Daniel (not his real name) the minute I saw him, an impressive Oglala Lakota man who looks the classic elder. Imposing and direct in manner, he wears a long silver ponytail and works as an artist, activist and interpretive guide for the U.S. Park Service in Badlands National Park. During my volunteer service on Pine Ridge last May, Daniel provided a running commentary over the school bus intercom as we bounced along reservation roads. He was knowledgeable, articulate, funny…and blunt as a stone about U.S. government and Christian church failures with his people. But our Lakota Indian guide wouldn’t quit. He was guiding us, all right: guiding our hearts and minds right into an ambush with the superior forces of actual Indian experience. It was like the Little Big Horn all over again and us white people, like Custer’s 7th Cavalry, didn’t understand what was waiting over the next hill. “There’s some old pictures of the original Mission church,” Daniel said, pointing at the new walls around us. “Lot of people say it was beautiful. Fancy woodwork, elaborate altar. 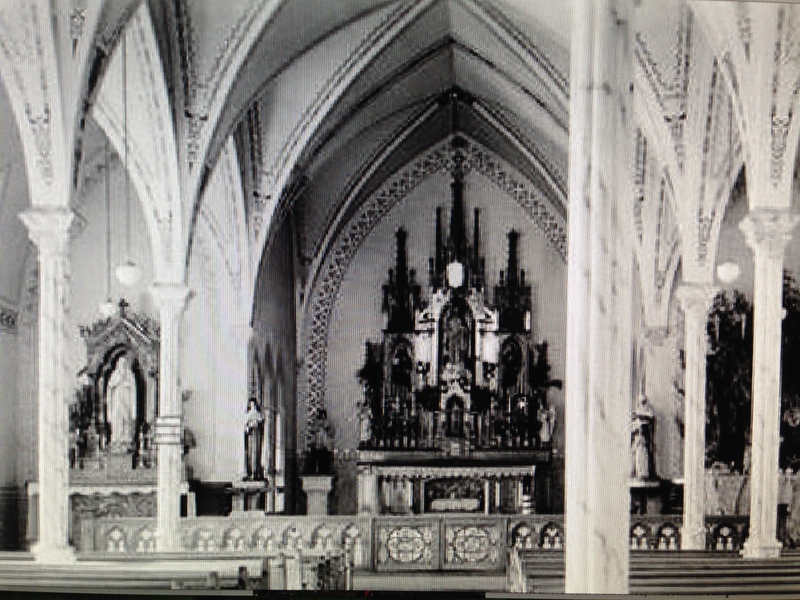 Right out of a European cathedral or something.” We peered at the photos. “The original church burned down in 1996. Good Friday. This here is all that’s left.” Daniel was pointing at the large gothic-style baptismal font standing in front of us. With its tall spire and European carvings, it looked about as out of place as a pope at a pow wow. “A lot of Indian babies got baptized in there,” he said with a hint of regret. “The blackened wood on the top there is from the fire.” Daniel looked out the window. “The bishop said the old church got hit by lightning, that’s why it burned down. But the Indians-” he turned back to the circle of white faces around him, “We knew it was arson.” Was Daniel faintly smiling? I couldn’t tell, but this was starting to feel personal. A deep swell of indignation was rising hot in my chest that would lead to no good. I have to get out of here, I thought, and started for the door. But the crowd of other volunteers was blocking easy exit from the church. I decided to wait and talk with Daniel alone. He finished his talk and the rest of my group filed into the church sanctuary for a tour of the attached Indian school. The doors closed behind them and then it was just Daniel and I standing in the foyer. 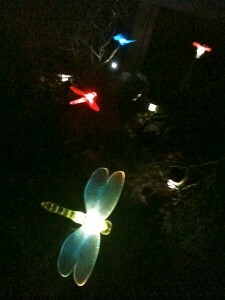 As I walked over to talk with him, I recalled all we had seen during our volunteer week. 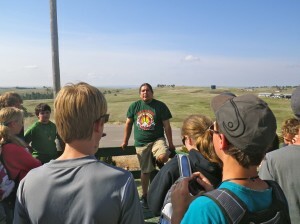 The focus of our time on the Pine Ridge Reservation (the “Rez” as locals say) was work and cultural exchange facilitated by the Re-Member volunteer organization. 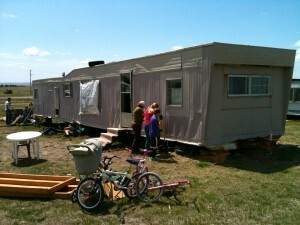 And we worked: we built outhouses, wheelchair ramps and insulated skirting for battered old trailer homes that lacked electricity or running water. 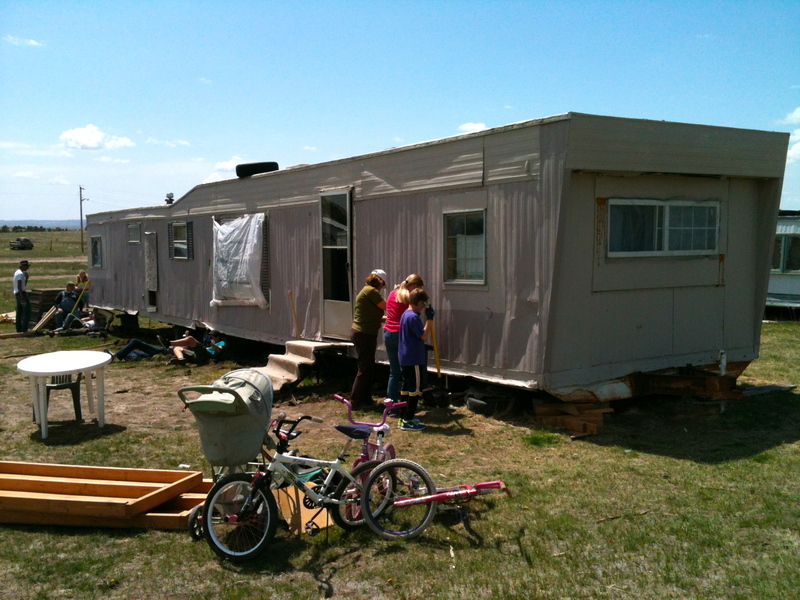 We assembled and delivered bunk beds for children, dug an innovative “waterless garden” in the hard-baked earth, toured schools, historical sites and the stark, gorgeous Badlands. Under big Dakota skies we ate fresh Indian tacos and admired the paintings and handwork of Lakota artisans. My favorite visits were to the little cabin outside Manderson belonging to the Lakota medicine man Black Elk, and later to radio station KILI. The KILI studio, perched on a remote hillside off the highway, is a hip one-hundred-thousand watt FM radio station with loyal internet fans as far away as Germany. It broadcasts everything from traditional Lakota songs, to local news, Indian rap and a hilarious pow-wow version of the Flintstones’ Theme (Black Lodge Singers). 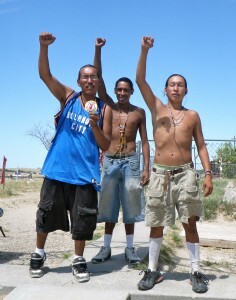 The Lakota people we met around the Rez were kind, warm hearted and deeply centered. So much so that I often had the unpleasant sensation of talking too much, too fast and too invasively. Just standing with these people made me feel like I was in a hurry. The difference, perhaps, between living life in relationship to the clock, and living life in relationship to the earth. In the evenings we gathered to hear from Lakota elders, a high school teacher, spiritual leaders, an activist, a grandmother. Hanging on the wall behind the speakers’ podium was a long scroll of paper with the official title and date of each of the three-hundred-seventy U.S. treaties signed with the Indian nations. Even though I have a law degree, it hadn’t struck me until then that an Indian treaty is a U.S. federal law: like any treaty with a sovereign nation each one had to be debated in Congress and signed by the U.S. president. Each one went into the U.S. Statutes books with a specific law number. “Yet every single one of those treaties was broken by the U.S. government,” said one speaker, pointing up at the scroll. “Not a single treaty was broken by the Indians. Not one.” Three-hundred-seventy United States laws, all violated by the United States. Strange business. And then there is Wounded Knee. 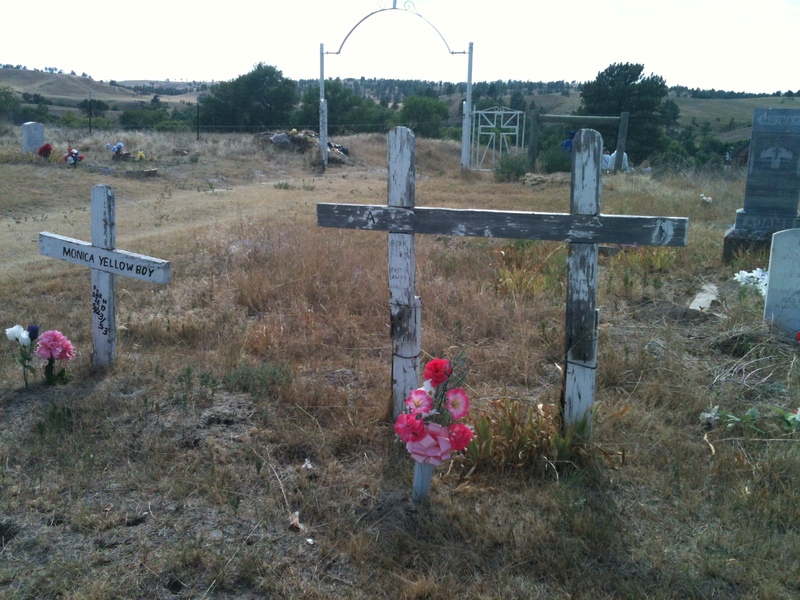 Of all the ranging high plains landscapes, villages and historic sites on the Pine Ridge Reservation the saddest place of all is the little cemetery on a hill outside the town of Wounded Knee. 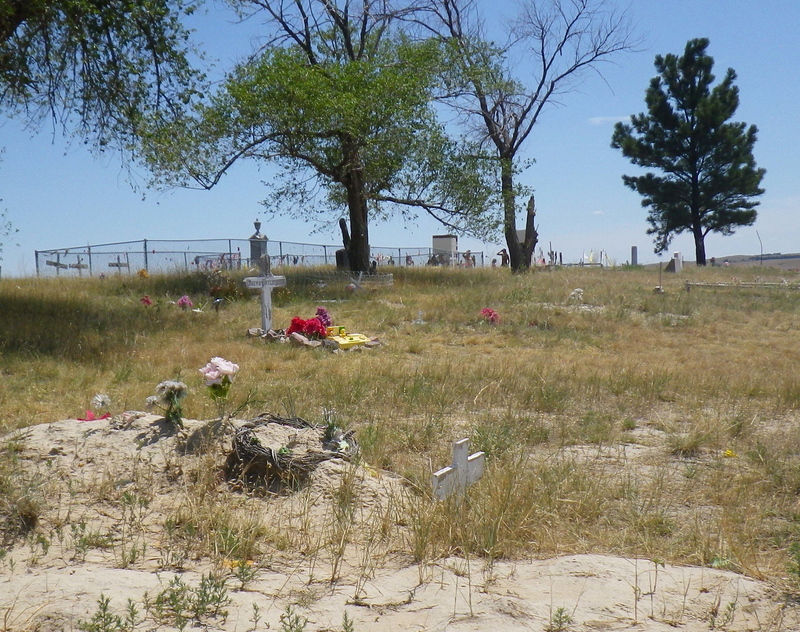 It marks the mass grave where the frozen bodies of several hundred Lakota men, women, children and a Lakota chief were dumped after the “battle” of Wounded Knee on December 29, 1890. 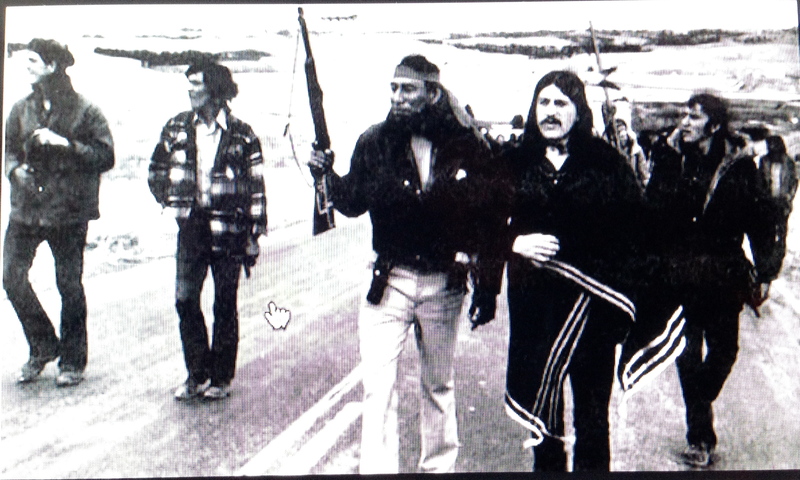 In the high-school-history-class version of this event, a large group of armed, reservation-resisting Lakota Indians attacked U.S. troops sent to protect the tribe’s own winter rations. The brave U.S. soldiers prevailed and the survivors were awarded Medals of Honor for their heroism. From each Lakota speaker we heard the same theme over and over: even the good intentions of white settlers, educators and missionaries had a devastating effect on Lakota society. From the vast plains on which their hunter-gatherer society depended, the Lakota were suddenly restricted to designated acres of reservation land, thin government rations and instructions to suddenly begin farming. 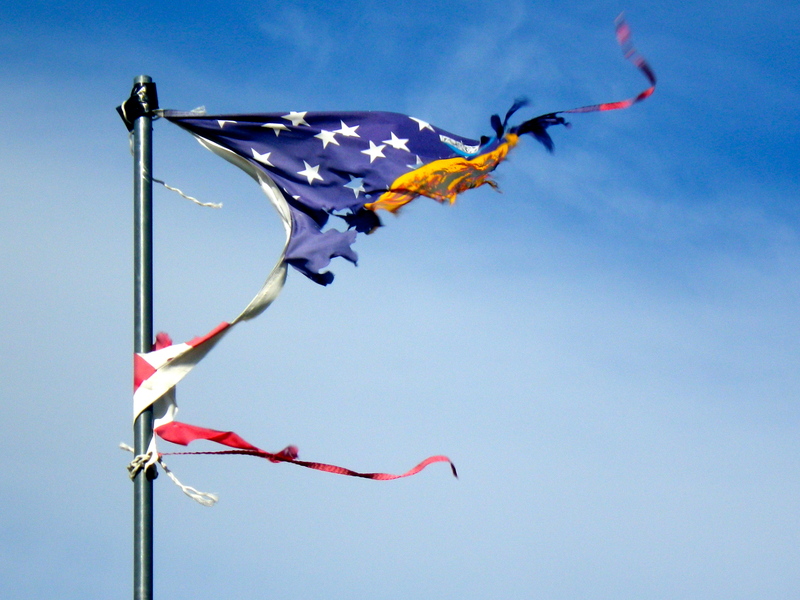 The Lakota language was forbidden. Children’s long hair was cut off. Hand-made tribal garb was replaced with European-style clothes. 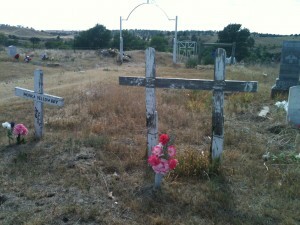 Worst of all, the Lakota spiritual ways were gutted. I was now standing next to Daniel in the back of the church, looking at the volunteers in the pews. I told Daniel I found his words about church workers difficult to hear. I told him I had served twenty years as a Catholic lay minister in hospitals, nursing homes, hospices and a university campus. I’d worked with Indians, like the Ojibwa of Northern Wisconsin. I’d worked with AIDS, alcoholism, abuse, gunshots, suicides and dead babies. I told him I knew there were problems with the churches: patriarchy, overzealous missionaries, insensitivity. But that I thought most of those people meant well, had good hearts and really believed they were doing good work. That I thought I had done good work. 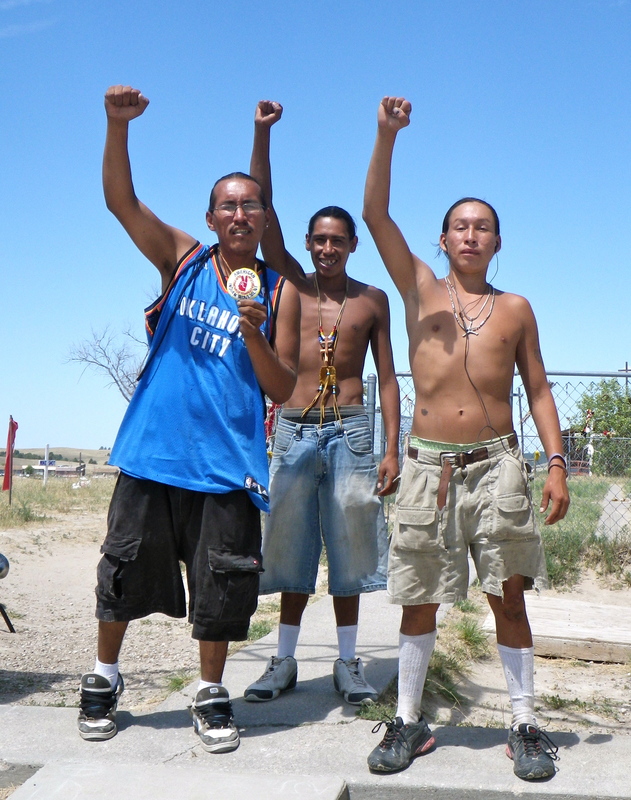 Let’s stop at this point in the Pine Ridge/Indian story. This is about the place where people (like me) change the channel or send a money donation to help those unfortunate people on their reservation. In either case missing the point that its our own government, our own collective ambition and taxes that created and now maintain the three hundred ten Indian reservations across the United States. Out of sight, and out of consciousness. You will not find Pine Ridge mentioned in the tourist brochures for nearby Black Hills water parks, Reptile Gardens and gold mining museums. 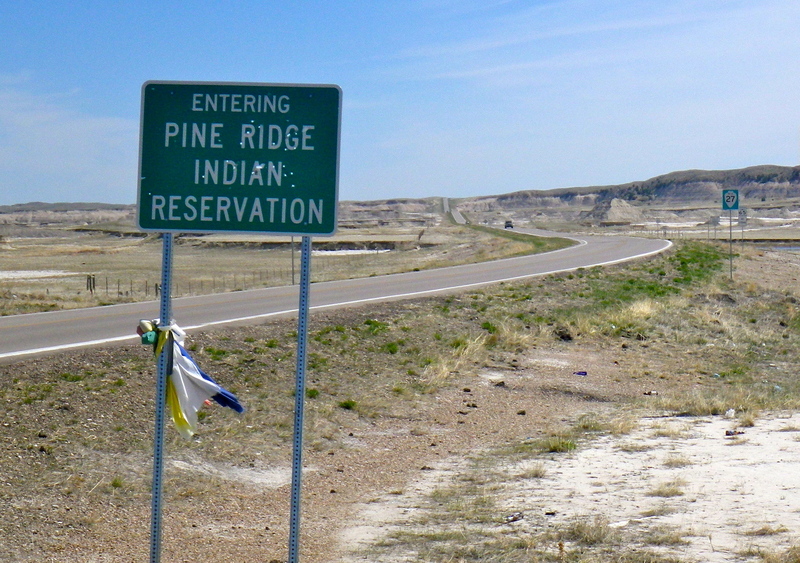 How many Americans on their way to Wall Drug or Mount Rushmore even notice the I-90 exit signs for Pine Ridge Indian Reservation? How many actually visit this remnant of the Lakota nation, still larger than Delaware and Rhode Island combined (not to mention the nearby Rosebud, Standing Rock, Cheyenne River and other Lakota reservations)? 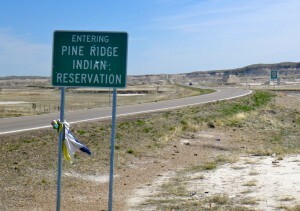 My experiences on Pine Ridge got me thinking about the “reservations” we all are subject to. Not just reservations bounded by cattle fences and U.S treaties. But reservations in the mind, bounded by consensus belief systems: social, economic, racial, religious… the whole self-enforcing cultural grid we live in. 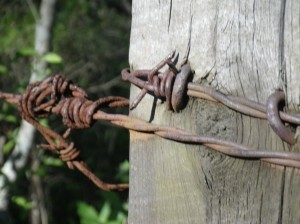 Although you cannot see your own virtual “Rez” (and your psyche will resist your questioning it), it is possible to feel its barbed fence lines from time to time. Whenever you are not free to follow your heart in some new direction, relationship, spiritual path or opportunity. 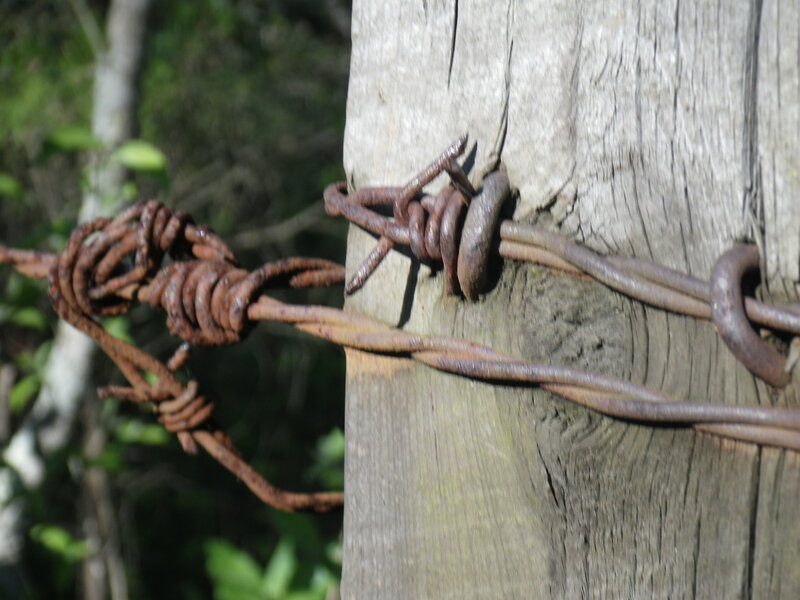 When fears arise in your mind that stop forward movement on a dream: fear about what your partner would do, what friends would say, your social status, upsetting the boss, loss of income, being alone… These are the barbed wires of the belief system enclosing your personal Rez. That’s the mind Rez. It’s what we call fear-based living, in my shamanic study and practice. In my case, I struggle to get off the “educated, middle-class white male” reservation. The white male Rez is particularly hard to see because Western society is organized to protect and justify it beyond question. The only way for an educated white male to get a glimpse of its fence wires is to get stuck by a few of the barbs himself. My first experience of being confined by the white male belief system was in law school in the 1980s. I had decided at the end of my three years of hard training and passing the Oregon bar exam that I didn’t want to practice law. The silence from my friends and family was deafening: an utter no comprendo. “But that’s a good profession/You’re about to make a lot of money!” sums up their reaction. I couldn’t imagine enduring an entire career just for the money. But my peers and parents disapproved, even after I found happiness and satisfaction (and a spouse) in my new field of much lower-paying ministry work. This experience of the hollow expectations of my class was startling and painful, as if I had stumbled into an unseen fence in the dark when I thought I was on open land. 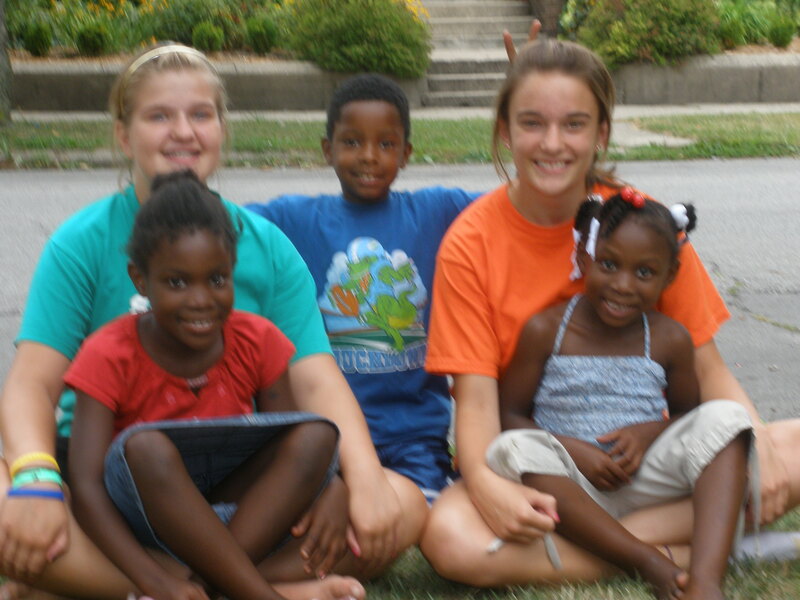 In 1996 my wife and I moved from a “nice” middle-class neighborhood to our current inner city neighborhood. The move seemed smart to us on several fronts: houses were so inexpensive in the inner city we could get a bigger house on a huge lot, pay it off in several years and be debt-free. The neighborhood was conveniently located close to work, church, grocery and downtown; we could sell one car, walk or bicycle with the kids to destinations, burn less gas and gain fitness. But my friends and church peers seemed deeply disturbed by this plan. “There’s no resale value there.” “Aren’t you concerned about the girls’ safety?” “Don’t you want the kids to go to good schools?” Even our realtor, a white woman, sat me down and said, “Jeff, consider Regina’s welfare.” All white code words, I realized, for fear of black people and the poor. I was about to go off the white reservation! Into the jungle! And take an innocent white woman and her children with me! This was a deeply alienating experience from my own ‘tribe’, a polite shunning by educated and surprisingly fear-based people I would have expected better of. The last evening on Pine Ridge, our volunteer group was invited to share a gift we each had received during the week, and a gift we’d like to return. I said I had received two big gifts. One was a shift of heart from pity for the visible Rez poverty and social issues, to admiration and outright envy for the unseen yet vibrant Lakota spirituality all around us. Their sacred, earth-honoring ways, inextricably connected with nature and all living creatures, reach far beyond humans and human institutions. We have forgotten this way, in America. My second gift was from Daniel. When he shared his own identity confusion and the admonishments from Lakota peers to “get with the Indian program”, I instantly identified with his struggle. Not as a Lakota, of course, but as a man who had also been stuck between my own belief systems, among my own “people”. Who am I? Where do I fit in? For a few moments, we slipped through the battle lines of our ancestors and onto holy land of shared compassion. Just two ordinary men, trying to make our way among the obstacles of life. The one gift I’d like to return to Pine Ridge, if I could, would be some kind of great vision from inside their own hearts. A vision for healing, for power and for a way forward. A vision that would help shift their story from being victims of the U.S. government, church missionaries and beer industry into a thriving nation fully aligned with the deep heart of Lakota spiritual heritage. And somehow finding the best means to do this. As we were reminded during our week, poverty is not lack of money. It is the lack of opportunity and outside investment. I drove back across the Great Plains in silence, over the Missouri, then on to Minnesota, Wisconsin, Illinois and Indiana. As I passed through the unnatural sameness of all the genetically modified corn, wheat and soybeans I tried to imagine these lands as they once were: covered by mixed and shortgrass prairie, countless buffalo and diverse animal, bird and insect species. There’s not much wildlife out there now, in the cornrows. The rabbits, birds, bugs and worms are missing: decades of herbicides and insecticides have seen to that. 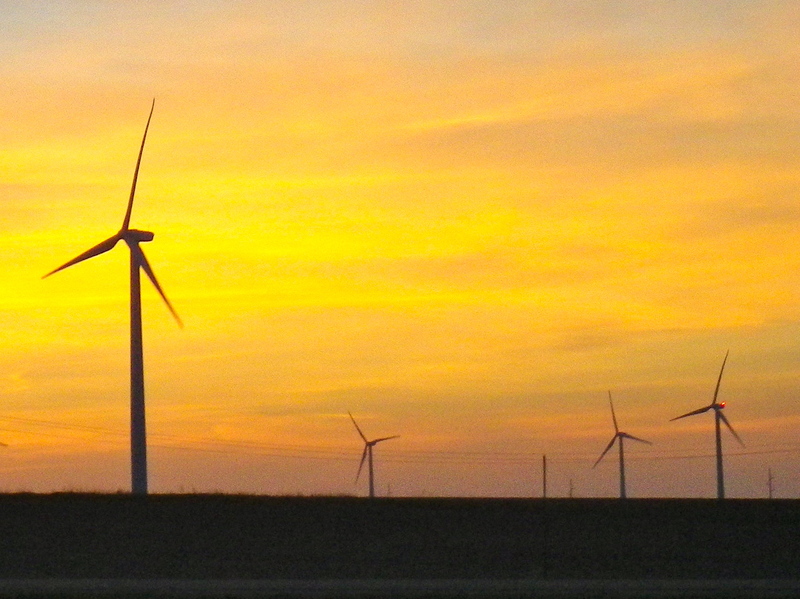 As the sun was setting I came upon a plantation of wind turbines scattered across the plains. I pulled off to the shoulder, shut off the engine and gazed at these modern giants as their long white blades cartwheeled in a silent ballet. After dark, only the red marker lights could be seen in a long line of red eyes atop each tower, pulsating in unison. On. Off. On. Off. What were they signaling? Was it a code talker from the ancestors? Or a plea for assistance to the ancestors? Help them. Slow Down. Pay attention. To the Earth. 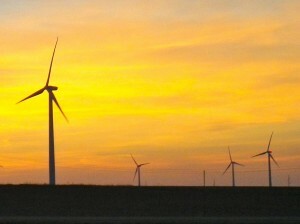 I pulled back onto the highway with the big irony still cartwheeling in my heart: I had just spent a week with human beings few Americans ever think about, yet these same people hold a sacred memory of living in balance with nature that could help save our planet. Exit 131, the Pine Ridge exit off Interstate 90, is a magical exit. Its a shaman’s portal to the past, among the living, that can shapeshift and bless the future. I returned to Pine Ridge the following summer and wrote another story you can read here, Where The Heart is Hidden in Plain View. I’ll be leading a group of volunteers back to Pine Ridge Reservation August 4-8, 2017. If you’d like to join me on the trip, you can read more about it and register on my website at greatplainsguide.com. Thanks for reading this today. Do share with a friend. Read others’ comments by clicking the “Thoughts” link below. I welcome your own comment in the box you’ll find at the end of all the others. Loved reading your blog, which I serendipitously came across. Enlightening and painful. I am part Cherokee. My dear great-grandfather NEVER talked about his life prior to coming west – first to California and then to Oregon, settling in a tiny country town as a sheepherder. After meeting my great-grandmother, he moved to Madras (Kah-Nee-Ta) and worked on the railroad. His mother came to visit from Missouri though, and we learned from her. I’ve been working for years on his family history, and it has been hard. He was such a good, kind, and humble man. What an incredible account! So crazy eye opening and so saddening too. I had a question regarding the first picture in the blog (of the American flag). That stunningly symbolic image is indicative – I believe – of the way American and Native American relations have been conducted throughout the past. I want to ask you some details about that photo. Where was it taken? What is the yellow cloth connected to the flag? How long has the flag been there? Why is it in such poor condition? In all honesty, this has inspired me to incorporate it into college essays and I would love to learn more about it. Let me know all you can on that photo!